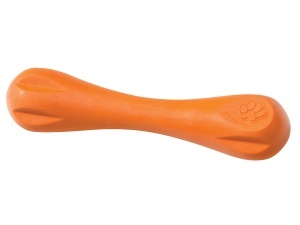 The Zogoflex Hurley is for all those dogs who love a bone. It bounces and floats, so can be played with on land as well as in the water. Dishwasher safe and free of toxins. Can stand up to the chew! Great toy for our otterhound pup who is a keen chewer. Other toys wouldn't last the day and would then have to be taken away. So far she loves this bone. It's also made of soft rubber so I'm not worried about it hurting her teeth. It isn't totally indestructible but will last. Great buy for a teething large breed puppy.